Former Minister of Social Justice Nick Begley is now student body president. Michelle Wu stepped down from her position as student body president last week. Begley is bringing a different style of leadership to the student body as displayed in a recent parliament meeting that he chaired for the first time. Inaccessible: The 800 building lacks the infrastructure to properly cater to students with disabilities. A physical altercation occurred on Feb. 20 in the parking lot east of the 3000 building. A desktop computer was stolen on Feb. 15 from SCC. 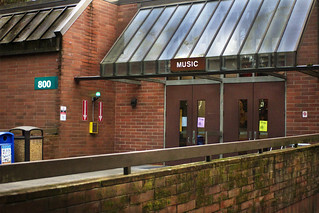 A window was found damaged on Feb. 14 in the PUB’s main dining room. A student made an offensive statement on Feb. 24 in the 2100 building. A new bill in the Washington State legislature could provide a way for students to pay for college without upfront costs. 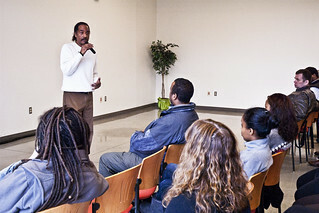 Aaron Dixon speaking to the attendees of the reading in the Quiet Dining Room. 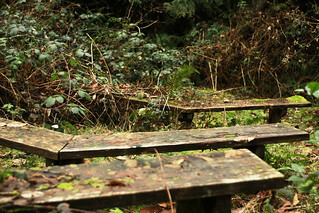 What's left of the amphitheater is overgrown and moss covered. Math haters: good news! If you started in Math 80, you used to have to take two math classes to get into a college-level math class. Now you’ll only need to take one class – if you’re not planning on going on to the calculus sequence at SCC. SCC will no longer offer Math 80 and it has been replaced this quarter by Math 98 which means students no longer need to take Math 99 to gain entry into a quantitative/symbolic reasoning (QSR) class such as Math 107, Math 146 and Philosophy 120. Students need to fulfill five credits of QSR in order to complete their degree.